Alekhine-Chatard Attack - Chess Gambits- Harking back to the 19th century! Chess Gambits- Harking back to the 19th century! 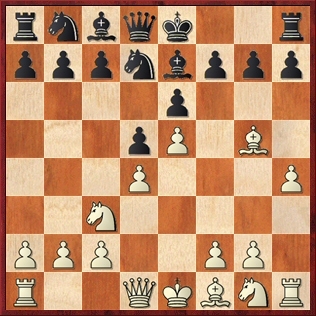 The Alekhine-Chatard Attack is a white gambit against the French Defence. It runs 1.e4 e6 2.d4 d5 3.Nc3 Nf6 4.Bg5 Be7 5.e5 Nfd7 (all standard stuff so far) 6.h4!?​. Unlike many other gambits covered at this site, the Alekhine-Chatard Attack is quite often seen at grandmaster level and is widely considered fully sound. The gambit was used to good effect by Alexander Alekhine in the early 20th century, most notably against Fahrni, Mannheim 1914, when Black accepted the gambit and succumbed to a strong attack. The idea is that if Black wins the g5-pawn, then it will open the h-file for White's rook at h1, and bring the black queen out to g5 (i.e. 6...Bxg5 7.hxg5 Qxg5), where it will prove vulnerable to attack from the white pieces. Black often refrains from taking twice on g5, but in those situations White generally continues to pursue the enemy king. The h-pawn can be advanced further, particularly if Black opts to castle to the kingside, and sometimes the g and f-pawns come forward in support. Thus, combative, knife-edge chess often results regardless of whether the gambit is accepted or declined. White should also be aware of 6...f6 and 6...Nc6, since both of those line offer Black a few tricks. Since White's h2-h4 doesn't pose any immediate threats, Black has many possible ways to decline the gambit. The reply 6...f6 is somewhat weakening, but White needs to find the tactical cheapo with 7.Qh5+ g6 8.exf6! (the point being 8...Nxe5 9.fxe7) to get a significant advantage. Black can prepare it with 6...Nc6 covering e7, and if 7.Qg4?! then 7...f6 is very good for Black, but instead White can get a small advantage and long-term attacking chances with 7.Qd2 or 7.Nf3. The 6...Nc6 line is, however, quite solid for Black and unlikely to allow White to get a quick win. The first of Black's important options is 6...0-0, which "castles into the attack" but it is not easy for White to blow Black off the board. White generally follows up with 7.Qg4 putting further pressure on the kingside and preparing queenside castling. White gets long-term attacking chances in this line, but having castled kingside, Black can set about developing compensatory queenside counterplay. In the following illustrative game White actually lost, but the notes show that White had a reasonable position in the early middlegame. This line is one of Black's better tries regarding attempting to level the chances. Another important option for Black at move six is 6...c5. This counterattacks immediately at White's centre, but I don't think that it equalises. White's only try for advantage against it is to exchange bishops with 7.Bxe7, and then if Black replies with 7...Qxe7, then 8.Nb5 is a problem, threatening to hop the knight into c7 or d6. Black normally sacrifices an exchange with 7...0-0 8.Nc7, but this probably does not provide enough compensation (though White does get put on the defensive). So Black often takes back with the king instead, but this leaves Black with long-term problems with king safety. Overall, I think this line must be slightly better for White, and it can lead to some quick victories if Black doesn't play accurately, but Black does get some counterplay. Black covers the b5-square and prepares to play ...c7-c5 without allowing White to get in Nc3-b5 in response. However, I don't trust this line for Black. White plays 7.Qg4 and Black does not have a particularly ideal way of defending the kingside (the immediate threat is to play Bxe7 followed by Qxg7). Black mainly tries 7...Bxg5, which allows White to get a half-open h-file for the king's rook without having to sacrifice a pawn, or 7...h5 followed by 8...g6, which prevents any immediate attacks but is rather weakening. Moving the f-pawn (7...f6 or 7...f5) is somewhat dubious. White can look forward to good long-term attacking chances and some advantage if facing this line, although there is no immediate kill if Black plays accurately, and Black's positions are just about playable. Like 6...0-0, this line is not a certain "equaliser" for Black, but gives Black good chances of equalising, usually in a double-edged position where both sides have attacking chances. Black kicks away the g5-bishop. White can either retreat it to e3, or exchange bishops on e7, and I am not sure which is better. In both cases, White usually castles queenside and Black's king ends up in the centre or on the kingside, with Black getting counterplay by advancing the queenside pawns. Black usually plays ...c7-c5 at some stage, challenging the d4-pawn, and White chooses between letting Black exchange pawns on d4 and holding onto the strong-point on e5, or letting the e5-pawn drop with d4xc5, ceding some central control to Black in return for increased piece activity. Black can win White's h-pawn with 6...Bxg5 7.hxg5 Qxg5, but this brings Black's queen out into the open and opens up the h-file for White's rook. Black can probably equalise the chances with accurate play, but even here, that is not totally clear, since White has a few good ways to set about generating compensation for the pawn.
. The original approach was 8.Nh3 attacking the black queen, followed by 9.Nf4, envisaging sacrifices on d5, as famously played by Alekhine against Fahrni, Mannheim 1914. However, I don't trust it, because Black appears to have a solid response with ...g6, ...Nd7-b6, ...Bd7 and ...0-0-0, where I am not convinced that White has enough for the pawn. Even the main lines with White getting in the Nxd5 sacrifice can often lead to level endgames (though at club level both sides may go wrong, of course). Therefore, I suggest that White takes a closer look at 9.Qg4 intending Nf3-g5, which seems to give White better long-term attacking chances. Another interesting alternative is the rare 8.Nb5, targeting Black's weak point at c7- this move has come to the attention of French Defence expert John Watson. The knight move is justified because it forces Black to play an undesirable move, ...Qg5-d8 or ...Nb8-a6, before setting about kicking the knight away from b5, and stops ...c7-c5 because of Nb5-d6+. White again follows up with Qg4. White immediately attacks Black's h7-pawn. This move generally aims for longer-term positional compensation rather than an immediate attack, and offering to trade queens with 8...Qg6 doesn't appear to help Black; both 8.Qxg6 and 8.Qd2 give White enough compensation. Thus Black usually parries the threat to the h7-pawn with 8...h6 or 8...g6. After 8...h6 White should play 9.Nh3 intending Nf4 or f4, since meeting this with ...g7-g6 would now weaken the kingside considerably. After 8...g6, the same plan is again playable, but White can also consider 9.Nf3 preventing the sneaky retreat 9...Qh6 which makes queenside castling temporarily problematic if White plays 9.Nh3. White appears to get enough compensation for the pawn, although Black's position is reasonably solid.